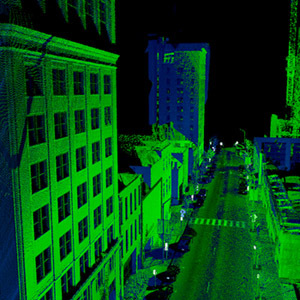 Mobile LiDAR is a state-of-the-art technology used to collect mass quantities of terrestrial LiDAR for topographic mapping and asset extraction, and our team has been on the forefront of its application. Two Trimble MX8 systems use vehicle-mounted equipment, including two 3D laser scanners, front, rear and side-facing cameras, a military grade IMU and two GPS receivers to collect continuous spatial point data while traveling at highway speeds. This fast and accurate collection provides the most efficient method of topographic and surface feature data collection along highways, secondary roads and other routes permitting vehicle access.